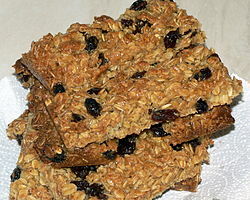 Flapjacks are a type of cake made using rolled oats, butter, brown sugar, and golden syrup. They're great for packed lunches and the like. This is a simple version with no fruit or raisins added. Pre-heat the oven to 150°C (300°F or Gas Mark 2). Place the sugar, butter and golden syrup together in a medium saucepan and heat until the butter has melted. Remove the saucepan from the heat and stir in the porridge oats. Bake in the centre of the oven for 40 minutes. When baked, allow to cool in the tin for 10-15 minutes before cutting into oblong bars. Leave until cold before removing the flapjacks from the tin, then store in an airtight container. Beat the butter and sugar until the mixture is creamy, then stir in the warmed golden syrup. Work in the rolled oats and salt. Put mixture into tin baking tray and bake in preheated oven for 30 minutes or until brown. When firm, cut into slices and leave in tin until cool. Serve with whipped cream or with melted chocolate to dip.